I have not written one single training post for the NYC Marathon. In part because I have been so busy but primarily because NYC is not a “goal race” for me. I am not running it for time – I’m running it for the experience. I always love reading about others training, however, so I thought that some of you might be interested in my buildup to the race. I started training for NYC in August. I wanted an easier, more laid back plan and my coach delivered. I have been running 4-5 days a week (mostly 5) instead of 6. A lot of my workouts have been time based, which I like. I’ve also given myself more grace than I typically do if I have to move a run around or even miss a run. I probably missed 3 runs over this cycle, which is pretty unheard for me. It was totally fine – which of course it was and I didn’t stress a bit. So far, I have run about 350 miles preparing for NYC. I expect to run another 30 or so miles in the 13 days before the marathon, for a total of around 380 miles leading into the race. To contrast that with my Grandma’s buildup – I ran around 800 miles while training for Grandma’s. To be fair, that was a six month long trainer cycle and it was a gradual buildup. My buildup for Berlin was just under 600 miles. So this is a lower mileage cycle and I’m totally fine with that – this was the point. 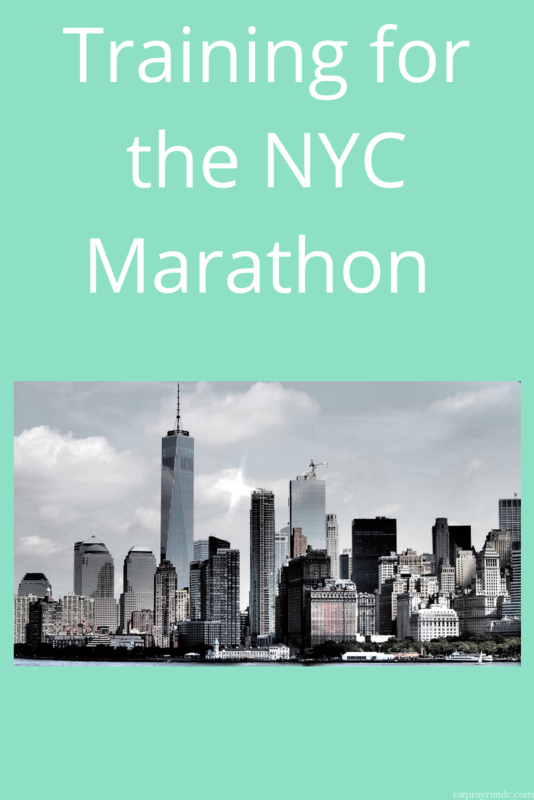 I wanted to run enough to be able to successfully complete NYC but I wanted to also have a life and have as much fun while marathon training as possible. My plan is currently to train again for sub-4 in March…but that is all dependent on how I feel after NYC. I do not have a specific goal time for NYC. I imagine I will run in the 4:15-4:30 range and that sounds good to me. I am so excited about the experience and can not wait to experience each of New York’s boroughs. I do plan to write a race recap so check back here in a couple weeks to hear how it goes! Who else is running NYC? So exciting! I love the laid back philosophy and can’t wait to hear about how much fun you have! I’m excited for you! I’d love to get there someday. I’ll be cheering you on in Pennsylvania and I can’t wait to see how you do!